The College’s student residences include eight halls with traditional, suite and apartment style housing. They include College Park Hall (upperclass); Davidson (first-year) and Fox (upperclass) Houses, West College (first-year); College Park Apartments (upperclass); Garnet Commons (upperclass apartments); Richmond House (first-year); and Webster House (focused study). Focused-Study Housing, incorporating a 24-hour quiet consideration is available to all students. Upperclass students also are eligible to live in Minerva Houses, Greek Housing or Theme Houses. Minerva Houses (2004) - Seven houses make up the student-run Minerva Houses. Up to 45 students live in each of these houses: Beuth House, Golub House, Sorum House, Wold House, Messa House, Green House, and Breazzano House. College Park (1999) - The College Park neighborhood adjacent to campus offers apartment-style housing for 140 students, including numerous theme houses. College Park Hall, which opened in the Fall of 2004, houses 260 upperclass students. Davidson House (1968) - Named for Carter Davidson, 13th president of the College (1946- 1965). Houses first-year men and women in suites and men in double rooms on the lower level. Also the home of the Sigma Phi Society and the Alpha Epsilon Pi fraternity. Edwards House (1948) - Named after theologian Jonathan Edwards, Jr., second president of Union College (1799-1801). Houses Theta Delta Chi fraternity. Fero House (1896-97) - Named after Franklin L. Fero 17’, who financed the renovation of the building in 1990. Home of Alpha Delta Phi fraternity. Fox House (1968) - Named for Dixon Ryan Fox, 12th president of the College (1934-1945). Houses upperclass men and women in suites, men in double rooms on the lower level, as well as the Delta Kappa Epsilon fraternity. Garnet Commons (2015) - Houses 80 upperclass men and women in apartment style housing, with private bedrooms and ample common gathering space. Hickok House (1957) - Named for Laurens P. Hickok, Union’s fifth president (1866-1868). Home of the Gamma Phi Beta sorority. North College (1814) - Used for classrooms and labs until the late 1920s, when it was converted to a residence and office building. Is now the home for Messa and Wold Houses. Potter House (1961) - Named for Dr. Eliphalet Nott Potter, grandson of Eliphalet Nott and the seventh president of the College (1871-1884). The Chi Psi fraternity is housed on the north side of Potter and the Delta Delta Delta sorority is on the south side. Raymond House (1961) - Named for Union’s ninth president, Andrew Van Vranken Raymond. The Sigma Chi fraternity is in the south side and the Sigma Delta Tau sorority is on the north side of Raymond. Richmond House (1960) - Named for Dr. Charles A. Richmond, president of Union from 1909-1928. Richmond houses first-year coed students. South College (1814) - Oldest residence hall still in use as a residence in New York, South College was home to Chester Arthur, William Seward, and most of Union’s oldest alumni. Sorum and Green Houses are located in South College. Smith House (1894) - Named for Rev. John Blair Smith, first president of Union (1795-1799). Houses upperclass coed students in a theme house focused on supporting multicultural issues on campus. Webster House (1920) - Named for Harrison E. Webster, Class of 1868 and president of Union from 1888 to 1894. Webster House used to serve as the Schenectady library and is now a focused-study, substance-free residence for first-year and upperclass students. Wells House (1908) - Named for Professor William Wells, whose family lived in the house until 1930. Renovated in 1994 as a theme house that emphasizes community service. West College (1951) - Named for the original West College, the College’s first home in the Stockade area of Schenectady, West was built to house the post-World War II expansion of student enrollment. Houses first-year students as well as one of the College dining halls. Theme Houses: Union gives students autonomy in creating the community atmosphere in which they live. The College recognizes 13 student-initiated theme houses. ARTS House is a home to students who seek to express themselves through the visual and performing arts. Bronner House is dedicated to furthering multicultural understanding among all students. Culinary House promotes expertise in culinary arts and healthy dining options. Dickens House celebrates the literary mind and holds events focused on literature. Iris House focuses on creating a supportive environment and educational events for issues in the gay, lesbian, bisexual, and transgender communities. Maker House encourages innovation, values creativity, and promotes collaborative problem solving. Ozone House is an environmentally-focused community designed to reduce waste and promote a more sustainable way of living. Religious Diversity House connects those from various religious backgrounds with one another and seeks to enrich the campus community with religious diversity and equality. Rights House promotes educational awareness and activism with regards to human rights, actively addressing issues of social justice. Symposium House seeks to heighten intellectual discourse outside the classroom. Tech House creates a space for the discussion and appreciation of technology and innovation in a social and cultural context. Thurston House promotes enhanced social and intellectual life with a focus on Asian cultures. Wells House seeks to strengthen the relationship between Union and the local community through volunteer service. Minerva Houses: Union’s Minerva Houses are designed to give all students an opportunity to make rewarding connections and to blend the campus social, academic and cultural life. Every student is assigned to a house, which can be a focus for social activities, dinners and discussion, making new friends, or simply a welcoming place. Up to 45 students live in each house; all houses are equipped with a kitchen, a great room, an office, and a seminar room for meetings and classes. Non-resident members may take advantage of house gathering space and activities even though they live elsewhere. Each house has an activities budget to be used at the discretion of the membership. All faculty and some staff are affiliated with one of the houses and join in many of the house events, giving students an enriched out-of-class experience. Fraternities and Sororities: Twelve national fraternities, five national sororities, and one local sorority have chapters in good standing at Union. The Alpha chapters of six national fraternities were founded at Union, starting with the famed Union Triad - Kappa Alpha (1825), Sigma Phi (1827), and Delta Phi (1827)*. The others formed at the College are Psi Upsilon (1833)*, Chi Psi (1841), and Theta Delta Chi (1847). The national fraternities also include Alpha Phi Alpha, Alpha Delta Phi, Alpha Epsilon Pi, Alpha Phi Alpha, Delta Kappa Epsilon, Phi Delta Theta*, Phi Iota Alpha, Phi Gamma Delta, Sigma Chi, and Zeta Beta Tau. The national sororities are Delta Delta Delta, Gamma Phi Beta, Lambda Pi Chi, Sigma Delta Tau, Omega Phi Beta, and Sigma Gamma Rho*. The local sorority is Alpha Delta Lambda. Union believes that a student’s life outside the classroom is an important part of his or her total education. These unique leadership opportunities challenge students outside of the class room on a daily basis. The student government (Student Forum) funds, organizes, and supervises a variety of activities and organizations; students are responsible for the planning and implementation of these student-funded activities with the assistance of the Office of Student Activities. The College requires students to have individual health insurance in effect as partial protection from the consequences of engaging in various activities and advises discretion while participating in these activities. There are about 100 clubs and organizations that fall in the following categories; Academic Clubs, Student Governance, Club Sports, Cultural Clubs, Religious Clubs and Organizations, Art Clubs, Service Clubs and Organizations and Media Clubs. Clubs are groups recognized by the Student Forum and funded by Student Activity fees. Student clubs must be open to all students paying the activity fee. Organizations are groups recognized by the Student Forum but not funded from Student Activity fees. Organizations may be selective as they are not funded by the Student Activity fee. An important and fundamental dimension of all individuals is their spiritual and ethical nature. The Office of Religious and Spiritual Life at Union is served by the Director of Religious and Spiritual Life and eight other volunteer professionals; the Campus Protestant Minister, a Catholic Chaplain, a Hillel Director as well as advisers to InterVarsity Christian Fellowship, Chabad, AUM and the Muslim Student Association. There are over a dozen religious organizations in addition to those served by volunteers including the Buddhist Student Association, the American Yoga Association, the Better Together Campaign, the Multi-faith Forum, The Heavenly Voices Gospel Choir, The Heavenly Liturgical Dancers, and the Sikh Student Association. Increase religious understanding across traditions. Engage and empower students’ exploration of faith. Provide for worship and observance of religious holidays. Provide opportunities for community service that integrates religious understanding with action. Offer pastoral counseling and spiritual direction. Develop and nurture student leadership skills. Offer a religious perspective to the academic community. The College believes that every student should be encouraged to take part in sports activities at a level commensurate with his or her abilities and interest. Each student should have the opportunity to improve skills and to learn new sports that will carry over later in their lives. Thus, Union offers an extensive program of intercollegiate, intramural, club, and recreational sports, along with a wellness program that provides students and employees the opportunity to learn the skills of lifetime sports while promoting healthy lifestyles. The College ensures that athletics be kept in harmony with the essential educational purpose of Union. Union College athletes, like those engaged in all extracurricular activities, are an integral part of the campus community and are students first. Intercollegiate competition is offered in 26 sports; for men, in baseball, basketball, crew, cross-country, football, ice hockey, lacrosse, soccer, swimming, tennis, and indoor and outdoor track; and for women, in basketball, crew, cross-country, field hockey, golf, ice hockey, lacrosse, soccer, softball, swimming, tennis, indoor and outdoor track, and volleyball. Union is a member of the National Collegiate Athletic Association (NCAA), the Eastern College Athletic Conference Hockey League (ECAC Hockey), and the Liberty League. Men’s and women’s ice hockey compete at the NCAA Division I level; all other sports compete at the NCAA Division III level. All club sports are administered through the Student Activities office. The most active and popular club sports are golf, ice hockey, karate, rugby, and skiing. An extensive intramural program is offered in a wide range of sports along with noncredit physical education classes as part of the wellness program. Facilities include Messa Rink at Achilles Center (hockey, recreational skating, and intramurals as well as locker rooms and athletic training facilities); Viniar Athletic Center, (basketball and volleyball); Frank Bailey Field, a multipurpose, all-weather, lighted field with a 400-meter track, stadium seating for 1,500 and press box (intramurals, outdoor track, football, lacrosse, soccer, and field hockey); Breazzano Fitness Center at Alumni Gymnasium (fitness center, swimming, racquetball, squash, and coaches’ offices); Garis Field (soccer and club sports); College Park Field, a multipurpose, all-weather, lighted field (soccer, intramurals and club sports); College Boathouse (crew); Memorial Field House (intramurals, recreation, indoor track,indoor facility for tennis and spring sports, locker rooms); Alexander Field (softball); Travis J. Clark Strength and Conditioning Center (varsity strength training) and eight outdoor tennis courts and an outdoor basketball/street hockey court, all used for intercollegiate competition, intramurals, clubs and open recreation. Women’s Golf competes at the Mohawk Golf Club in Niskayuna and Baseball competes at Central Park in Schenectady, both just a few miles from campus. 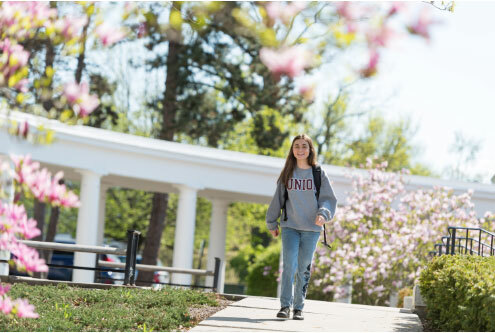 Campus Safety: Union College is committed to assisting all members of the Union College community in providing for their own safety and security. The Campus Safety Office is located in College Park Hall. Parking, vehicle registration, and ID card services are in the front lobby. Administrative offices and dispatcher are in the rear of the building. Special services, including lockout assistance, noise and nuisance control, security escorts, lost and found, and other needs associated with quality of life, safety, and security. Members of the department have portable radios and are centrally dispatched by control operators in the Campus Safety Building who monitor telephone and emergency lines as well as fire and security alarms. Every College building is linked to the Control Center for fire alarm monitoring, and a number of buildings have security alarm systems and access control. The Campus Safety Department is a private security force empowered by the College and the State of New York to enforce its rules, regulations, policies and the laws of the State of New York. Enforcement procedures include issuing parking tickets, issuing summary fines, filing conduct charges, and making arrests. The Campus Safety Department works closely with federal, state, county, and local authorities in the investigation and prosecution of crimes and in fire, safety, and health-related issues. Counseling: The Counseling Center provides services for students who elect to address personal/psychological concerns with a professional counselor. Typical concerns of students range from interpersonal issues, family concerns, academic problems, etc., to problems such as anxiety, depression, and addictions. Most students are seen in individual counseling sessions. Group and family sessions are arranged when appropriate. All communications with the Counseling Center are confidential. All Counseling Center services are free of charge for enrolled undergraduate students. The Counseling Center also provides a clinician for psychotropic medication. International Advising Office: The International Advising Office is involved in international student services and wants to serve students in the best way possible. We consider each international student a valuable member of the community with specific and unique needs. The Director assists individual international students by advising them concerning federal immigration, tax and labor regulations, and by providing counseling on personal, academic and cultural matters. In addition, the office promotes cross-cultural awareness in the community through educational programming, such as orientation, support groups, and the yearly international festival. Please contact Shelly Shinebarger, Director of International Advising Office, at (518) 388-8785 should you have any questions. Accomodative Services Office: The Accommodative Services Office is committed to providing students with disabilities equal opportunities to benefit from all services, programs, and activities offered. We are in compliance with Section 504 of the Rehabilitation Act of 1973 and the Americans with Disabilities Act. The Director determines eligibility for services, authorizes appropriate academic accommodations, provides academic advising and counseling, assists faculty with regard to disability, issues and questions, and helps assist students with self-advocacy in locating additional resources on or off campus. Please contact Shelly Shinebarger, Director of Accommodative Services Office, at (518) 388-8785 should you have any questions. Health Services: We are staffed with 4 Nurse Practitioners, 4 Registered Nurses, an administrative assistant and a collaborating physician. Our hours are Monday from 8:30AM to 8PM, Tuesday- Friday from 8:30am to 5 pm. We are closed on weekends. Local hospitals and urgent care facilities are available nearby for emergencies after hours. Visits are by appointment only. Walk-in patients with urgent concerns are assessed and triaged by the nursing staff. There is no charge to be seen by any of our staff. Charges for medications, x-rays, laboratory procedures, hospital visits, or specialists are the direct responsibility of each student. We are unable to honor insurance prescription cards for medications dispensed at Health Services. Students may request a written prescription and have it filled at a local pharmacy. Lange’s Pharmacy delivers to Health Services daily, Monday- Friday. If you would like to have your prescription card registered with Lange’s, please call (518) 374-3324. If you have a concern about the school health insurance plan, please contact Joann Cocca at (518) 388-6106. Stanley R. Becker Career Center: The Becker Career Center is committed to teaching students how to develop and achieve their career goals so that they are able to secure opportunities that invoke their passion and manage their career for a lifetime in a dynamic, diverse, and global environment. The Career Center empowers students to take personal responsibility for shaping their future. This is accomplished by encouraging self-assessment, exploration and reflection, providing opportunities to apply learning and begin careers, educating students about the world of work, and providing resources to advance students through all phases of their career development. Students are encouraged to take advantage of the Career Center during all four college years. A recommended first step is to learn about oneself by engaging in all aspects of college life including academics, student organizations, activities, and events. As students reflect upon these and other life experiences, their interests, values, and skills will become increasingly apparent and begin to serve as a foundation for developing their career plans. Career Center staff helps students develop five core career competencies: Career Decision Making (including self-assessment, exploration, and reflection), Resume Writing, Cover Letter Writing, Interviewing, and Networking. By mastering these competencies, students equip themselves with the lifetime ability of finding and securing positions for which they are well suited. Becker Career Center programs are designed to facilitate student growth in these areas and prepare students to find and connect with opportunities consistent with their interests. In addition, the Career Center houses a number of online career research tools that allow students to research potential career fields, locate employers by industry and/or geographic area, and connect with Union College alumni working in their targeted career fields. HireU, the Career Center’s web based database, provides students with access to internship and job opportunities from employers specifically looking to hire Union College students. For more information visit http://www.union.edu/offices/career/, or call 518-388-6176.